One-to-one, hands-on training is one of the best ways to improve your skills for ministry. 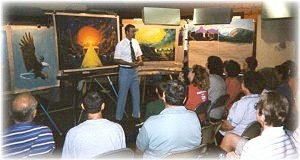 Brother Ray Dombeck offers private personalized chalk art instruction at your home. Raymond Dombeck is an experienced artist and a featured instructor at national chalk conferences from Delaware, Michigan, and Texas. He is an experienced art instructor who who is a favorite of his students across the country. He has taken his live art work ministry to Africa, Russia, Mexico and across much of the US. 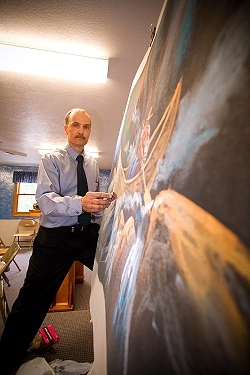 His wide range of live artistic experience includes mission conferences, revivals, teen camps, children crusades, foreign missionary work, and doing special days with his chalk art. Brother Ray also has 20 years experience as a sign artist and still does baptistery murals around the country. and as a professional sign painter for 25 years, Ray learned a unique blend of high contrast, large format, limited palette techniques. The tuition is $500 for 3 days plus room, food and travel expenses. Sponsor a class with 3 or more students at $300 per student.